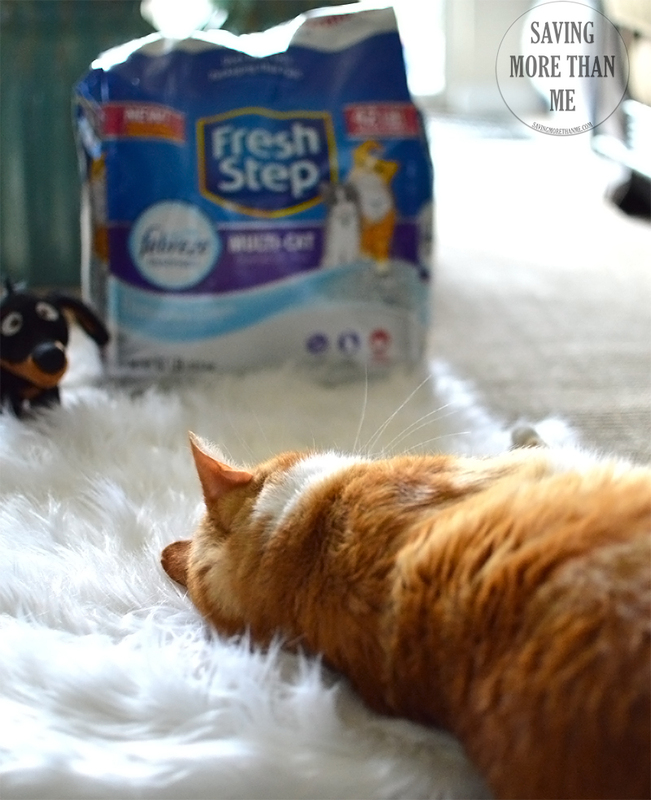 This post is sponsored by Fresh Step® and the BlogPawsPet Influencer Network™. 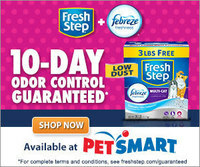 I am being compensated to create awareness about Fresh Step® with the power of Febreze™ available at PetSmart® but we only share information we feel is relevant to our readers. Fresh Step® and its parent company Clorox® are not responsible for the content of this article. Before Garfield became a part of our family, he was living a hard knock life. He was sleeping outdoors in the snow, heat, and rain, eating out of garbage cans and unsuccessfully fending off fleas and ticks. His predicament was through no fault of his own. His humans moved to another home and knowingly left him behind. We didn’t know it at the time but we moved into Garfield’s old house. It didn’t take long for him to start hanging around our back door trying to get inside. This was a first for us. Most stray cats we’d encountered just wanted to be fed and then they’d go about their merry way. Not Garfield. He wanted to come inside, badly. When the neighbors spotted my husband and I making a winter habitat for him, they explained how the previous tenants moved out and intentionally left Garfield behind. Monsters. Up until that point, we had no idea why the scruffy looking orange cat kept hanging around. Now it all made sense. He wanted to get inside our house because to him, it was home. 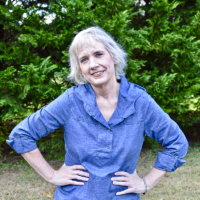 It would not have been out of character for me to adopt a stray cat, however, two of our senior cats died a few months prior, all within a 6 month time period. My broken heart just wasn’t ready for another cat. I needed time to heal. As winter turned into spring, and spring turned into summer, we discovered that something surprising had occurred. We began calling Garfield part of the family. We took him to the veterinarian, introduced him to our other cats, and put a collar on him. His affectionate, playful nature had won us over. Never again would he have to go into the dumpster in search of food. Never again would he have to sleep outside in the rain, sleet, or snow. Never, would we leave him behind. Delicious and nutritious cat food. 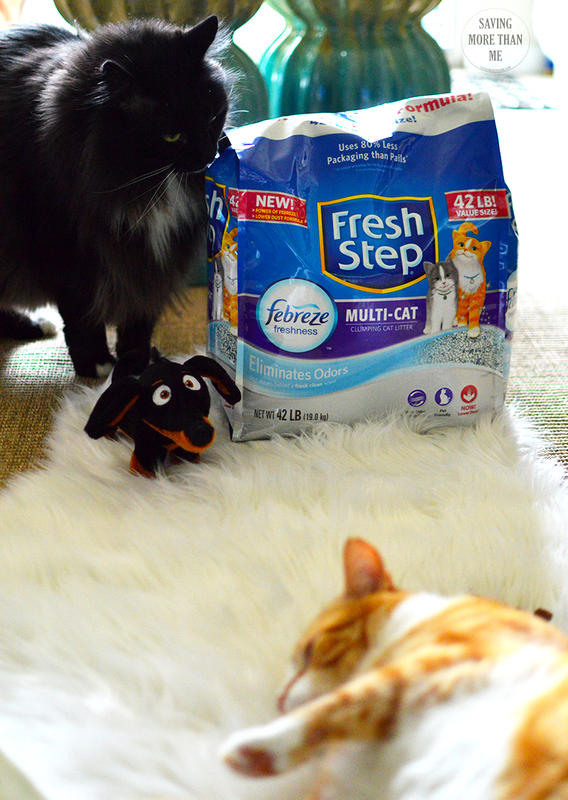 Cat litter that doesn’t stink—> Fresh Step® with the power of Febreze™. How do we know that it doesn’t stink? Because it’s the cat litter we’ve been using for the past seven months. As a reminder, we have four indoor felines and not a one will use a smelly litter box. Especially Garfield. He might get his paws dirty. The 10-day odor control guarantee that’s touted on the front of the bag? It’s the real deal. 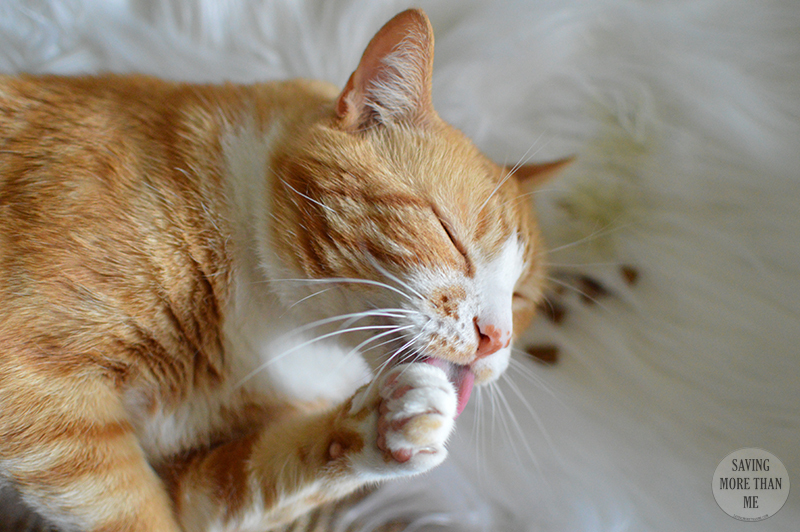 The litter box is almost #unsmellable. Except after Spitfire uses it (Garfield made me say that ;)). Spitfire sniffs out the situation. If you’d like a cat litter that actually does what it says (control odor), head to the PetSmart website to find your nearest location and get your furkids a bag of Fresh Step with the Power of Febreze cat litter. In the meantime, see what other cat owners are saying on the Fresh Step Facebook page. There’s cute cat pics too. Just sayin’. How sweet of you to adopt the cat left behind. What a lucky cat he is! I feel like we’re the lucky ones. <3 He’s such a cuddle bug. Bless his little heart! I am so happy that he has your family now to give him the wonderful life he deserves! I’m sure he loves his new home. We too lost a beautiful cat in February. His brother was heartbroken, so we adopted one from a shelter. Although they don’t cuddle like he would like, I know she is happy with her new home. Oh, what a great story. Garfield is adorable and so lucky to be part of your family now. He deserves all those cushy soft spots! He looks just like a cat I had as a child. He was the best mannered cat and he played with our doxie all day long. Like yours I think he just kind of showed up and we took him in. Good memories. We are a huge fan of Fresh Step. Our babies refuse to use anything else some days. 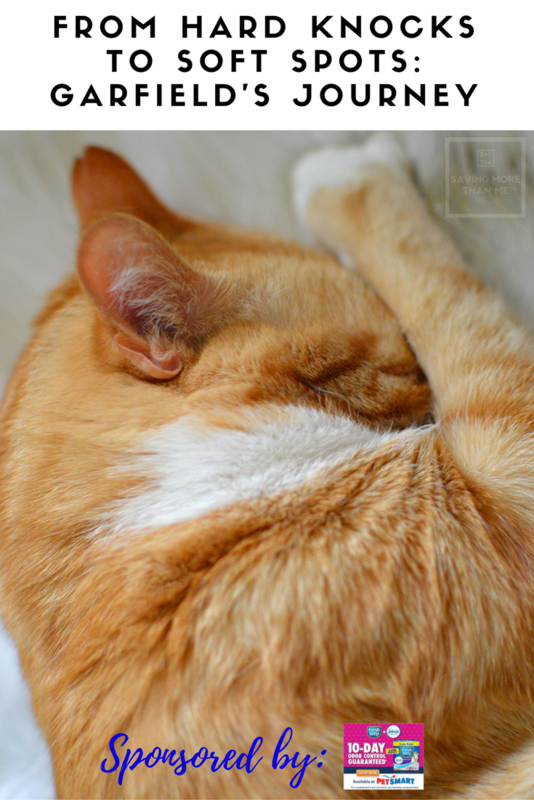 It’s so heartwarming to hear that Garfield has his forever family. 🙂 He definitely went from hard knocks to soft spots and it’s obvious how happy he is!